Mr. Giacobbe focuses his practice on representing public and private sector management in all aspects of labor and employment law. Additionally, Mr. Giacobbe is general counsel or labor counsel for several school boards, municipalities, independent authorities and other governmental entities throughout New Jersey. In this capacity, Mr. Giacobbe successfully argued before the Supreme Court of New Jersey in the matter of Loigman v. Middletown Township, 185 NJ 566 (2006), where the Court held that municipal attorneys are not policymakers under 42 USC §1983 and are therefore immune from liability for their actions during trial. Throughout his career, Mr. Giacobbe has handled complex labor negotiations involving public and private sector employers, often obtaining concessions from unions in areas such as salary, insurance co-pays and overtime. He routinely advises clients on termination and employee discipline, employee rights and benefits and other personnel matters. Additionally, Mr. Giacobbe has litigated claims involving employment discrimination, Fair Labor Standards Act, Family and Medical Leave Act, wrongful discharge, retaliation, wage and hour, whistleblower claims and restrictive covenant litigation in federal and state courts and before the Civil Service Commission, Public Employment Relations Commission and National Labor Relations Board. 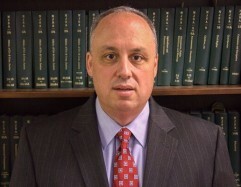 Mr. Giacobbe has written numerous articles on labor and employment law and has lectured extensively for the New Jersey Institute for Continuing Legal Education, New Jersey School Boards Association, and New Jersey League of Municipalities and regularly appears as a “New Jersey Super Lawyer” in New Jersey monthly magazine. Prior to entering private sector practice, Mr. Giacobbe served as judicial law clerk for the Hon. Garrett Brown, U.S.D.J. in the United States District Court for the District of New Jersey.